Maddie’s Fund and Furkids are inviting you to save a life (or two!) by adopting a pet in December. Can you help Furkids get more deserving cats and dogs home for the holidays this year? And perhaps win funds to help us save more lives? 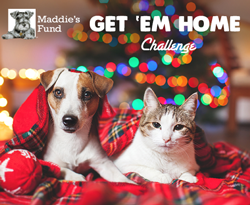 The Maddie’s Fund Get ‘Em Home Challenge is hosting a contest to get very adoptable dogs and cats who have been waiting longer than they should for their new loving home. Maddie’s Fund will be awarding more than $50,000 in grants to shelters across the United States! The contest goes through December 31, 2018.